By default, the Calendar control allows a user to select a single date. 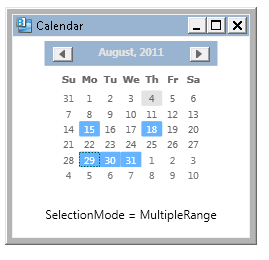 You can set the SelectionMode property to allow the user to select more than one date. 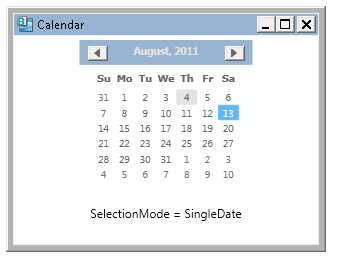 If the SelectionMode is SingleDate, the SelectedDate property (DateTime) will contain the selected date. 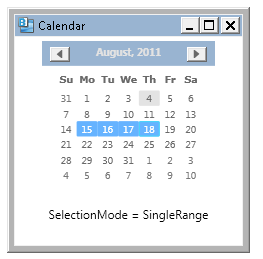 If the SelectionMode is SingleRange or MultipleRange, the SelectedDates property (ObservableCollection of DateTime) will contain all of the selected dates. The SelectedDate property will contain a copy of the first date in the SelectedDates collection. Hi. Why does the current time(4) remain selected when we select a date in single date mode? I want only one history to be chosen.